Discussions on all (non-biographical) aspects of the submarine forces of the Kriegsmarine. Supply ship Brake (ex Jurgens van den Bergh). he left Penang on February 26, 1944 and sunk/scuttled on March 12, 1944 in the Indian Ocean after an attack by "HMS Roebuck". 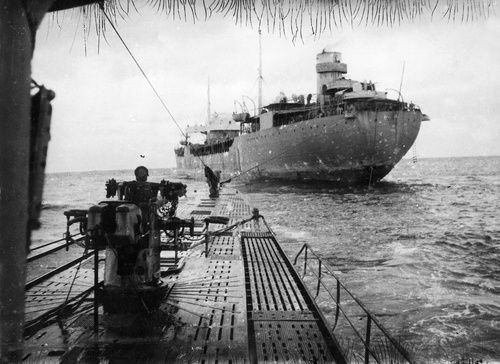 BRAKE left Bordeaux in October, 1942 and reached Penang in the Spring of 1943. In Septenber, 1943, she supplied U 168, U 183, U 188, U 532 and U 533 in the Indian Ocean. In March, 1944, she supplied U 188 and U 532 before being sunk, herself. Vielen Dank pb . Cheers. Raúl M .
Hilfskreuzer Kormoran (ex Steiermark - Hamburg Amerika Line) . Hello to all ; a little more: Versorger (Supply ship) "Python". Last edited by tigre on 11 Jun 2018 22:23, edited 1 time in total. just for clarification: by definition, the raiders (Hilfskreuzer) were not part of the "Etappendienst". Thanks pb . Cheers. Raúl M .
Name of the ship: Tannenfels (DDG Hansa Line) [Kapitan Haase] (Scuttled 26 (25?) August 1944 in Gironde, France). (1) Documented operation of this ship (U 154, 4th patrol). The U-boat did not receive any supplies, but was given the status report of "Tannenfels" (which included the status of survivors of the raider "Stier") which was later relayed in a radio message to the BdU from U 154, in order that "Tannenfels" maintain radio silence on her way to Bordeaux.